« Step 1, collect underpants! For $25 dollars you too can ride some shiny pixels. This is probably the most hotly debated topic on WoW forums at the moment, and rightly so. 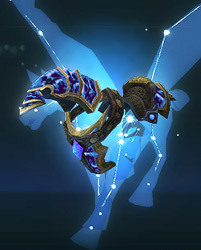 Offering probably one of the best looking mounts ingame at the moment for the price of 2-3 months subscription just doesn’t make sense to me. Yet yesterday people were talking about the 1-2 hour queue in the Blizzard online store… yeah, a queue for a virtual item… Blizz wins, common sense loses. It kinda makes you think that maybe there’s an ulterior motive behind this move. What if blizz is trying to slip a change into the game that’s been hotly debated against in the past under cover of the QQ over the horsey? Or are they just milking the cow for every drop of milk it’s got before WoW drops dead and Blizz launches World of Diablo or something. My stance on the whole debacle is simple – why should i spend $25 on a mount when I know that the most irritating and unskilled players on the server will have one too, making mine seem so much less impressive. Skill is more important to me than throwing money around. This entry was posted on April 16, 2010 at 4:09 pm and is filed under Rants, World of Warcraft. You can subscribe via RSS 2.0 feed to this post's comments. You can comment below, or link to this permanent URL from your own site. It all started whit badgers. Stupid wellfare epics!